Harrah’s Las Vegas is located within minutes of McCarran International Airport. We’re also within easy driving distance from Laughlin, and we’re a day trip from many surrounding areas, including Los Angeles. 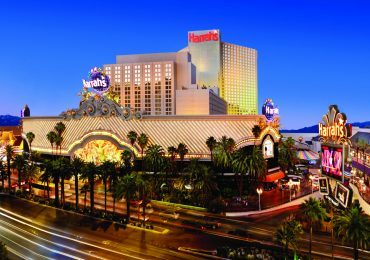 There is more than 87,000 square feet of casino space at Harrah’s Las Vegas. We’ve got the games you want to play! Choose from over 1,200 of the latest reel slots and video poker machines, 80 tables of blackjack, craps and baccarat, our comfortable Poker Room, and a 24-hour live keno action in our Keno Parlor. Enjoy all the action 24 hours a day! Enjoy the many dining options at Harrah’s Las Vegas! You can find a great selection of steaks, seafood and poultry entrees at The Range Steakhouse. Or you can visit our exciting venue, “I Love This Car & Grill” named after Toby Keith! Harrahs has over 2,500 beautiful rooms and suites, 86,664 square feet of casino space, seven outstanding restaurants, a sparkling outdoor swimming pool, a luxurious spa, state-of-the-art health club, full-service beauty salon, a unique variety of retail options and, of course, entertainment.